Another recipe success! I tried Aeri's Kitchen Beef Galbi recipe yesterday and my husband is still raving about it. I will be using this recipe again for Korean Thanksgiving and the New Year. I used pork LA galbi instead of beef as it's much cheaper, 17,000W ($17.00 CDN) for a pack of 10 strips. 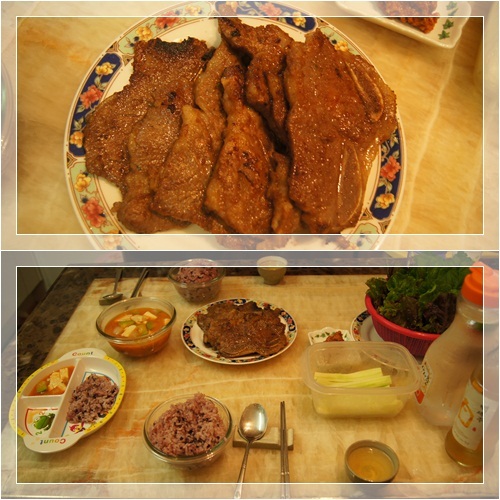 I served the galbi with bean paste soup, lettuce, cucumber pieces, chilled water, and ginseng liquor. I was worried the meat wouldn't turn out because the sauce looked a bit watery from the Asian pear pulp but it was all good. I thought we could put the galbi in the lettuce with rice and bean paste sauce but actually it didn't match at all. LA Galbi has a lot of bones so you have to eat it with your fingers or chopsticks and the lettuce masks the sweet taste of the galbi. We ended up eating the meat with kimchi instead because it can be a bit oily and the kimchi removes the oilness from your stomach. Preparation time is considerable. You have to prepare the galbi one day before you eat it. Making and cooking the galbi is not difficult though. We cooked the galbi in a frying pan with oil but next time I want to grill it for a healthier option. 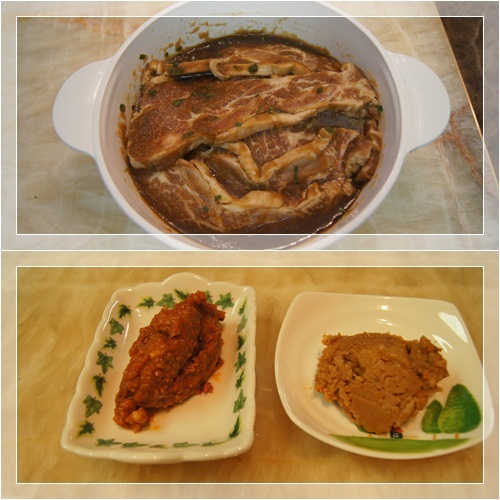 The bottom picture shows two types of bean paste. The one of the left is used as a sauce for mixing with meat, rice, and lettuce. It has various ingredients in it such as seasame seeds and spicy green peppers. The bean paste on the right is basic and is used to make bean paste soup.